UPDATED NOTE 2017: This blog article I shared back in 2012 is one of my most popular ones and continues to receive an influx of comments and messages, including personal stories and inquiries due to experiencing “accidents” or even loss of crystal friends. I’m so happy the share has been so supportive to many, as it seems that a lot of people are having experiences that are drawing them to the article, indicating a shared experience of shifts and crystal re-gridding work taking place collectively. I also want to add that while I’m so pleased that many have found peaceful solace in this share (my original intention), it was meant as a simple share of my personal experience prompted by an actual client’s question that others may find comfort and connection with for their own. Although many ask my advice, I am not offering readings, intuitive sessions/coaching via this article, nor do I claim to have all the answers or to be psychic. Every case is individual and relative to your experience. While I, or anyone else may be able to intuit something, take time to reflect and review all aspects of your experience to retrieve a pattern, theme, or a possibility, I highly always encourage you to trust your own instincts, as within most all of the questions I receive, I also see the answers you are overlooking because of that lack of self-trust we all go through along our journey or perhaps not investing the valuable time to reflect upon and ask those questions to yourself and your crystal. If I’m able to support anything, I hope it is a support of that self-trust and cultivating learning to listen to the answers you have within you. I get tons of questions, not just from this article, but others and other aspects of my work, that I hope you can understand that I can’t possibly answer everything nor in any full length, besides the fact that a lot of questions imply what would normally be an official, paid, intuitive session by someone like myself or another who offers that kind of work. I love helping others, but I feel the best way to do that is to empower you. I’ve seen this post become a wonderful collective community for sharing experiences that are wide-spread, but also seems to have become a place people may feel is an offering of more than the scope of what the share was and how it was intended. Sending you all so much love to self-nurture you into your highest potentials and empowered embodiment of trust for the truth you have within. I know that things like this can be devastating to us (I have had several precious crystals fall and crack, chip, break, etc. ), but I learned over the years that these are not coincidences and that there is purpose and meaning to why this happens and that there is actually nothing wrong. Crystals are like us..they have personalities and they go through transitions and shifts in their experience of life. Some crystals will change color, form, chip on their own without a trigger by us, or grow new inclusions inside. This is because they, too, are changing and growing and they need a new form to match. Sometimes they also create a fracture or opening so that they can draw in energy through that fissure, like a portal or gateway, to help them vibrate at a new energy level – that in turn provides us with the ability to access the same, as they support us in our lives. Sometimes it’s to release pressure, and other times it’s because they are correcting their form, feeling a different one is more suitable and comfortable for their energy and may not have liked the form they were cut into or outgrew it. Like we grow out of a pair of pants if they become too tight or too loose, for instance and need to get a new pair of pants that feel comfortable. Or when we cut our hair to match our energy and new style. And in relation to us, when they do something like this it can many times mean that we are working with the energy of forgiveness or perfection, for instance, in our lives and they are mirroring this for us, as they are our reflective, loving friends. They may also be trying to get our attention about something needing change in our life. So you can take a look at your life and see where you might be shifting yourself or have disregarded a nudge, where you may be needing to let off some steam (interesting my client was headed to the sauna as this happened) and release things, or needing a little extra love, letting go and relaxing, or forgiving – whether of self or others. 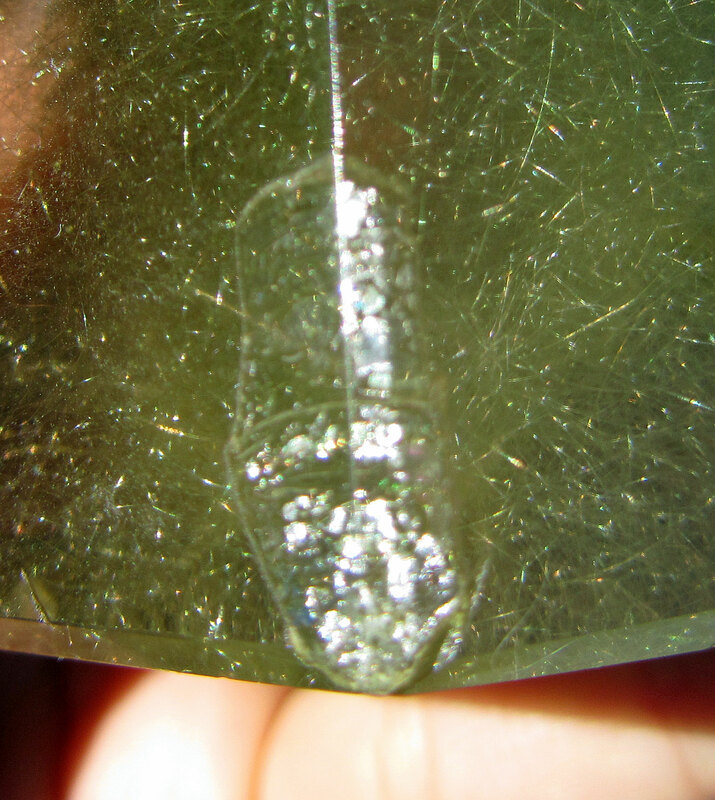 I don’t fix crystals, as in smoothing out scratches, rebuffing them or shaping them. There are those out there that can, but I wouldn’t necessarily trust just anyone to be doing what is in the best interest of the crystal unless they are in tune with and can communicate with them, otherwise they may create “actual” damage. It’s best when we can learn to accept and love the perfection within imperfection and receive the gifts that are hidden to those unable to “see.” My take is that there is purpose in their doing so and they are happy in their new form. It’s only we who need to learn to accept and love ourselves and others as unconditionally as they do. hope this helps a little. I’ve been through this a lot, as I said, and coming to understand this has made a great deal of difference for me in embracing that everything happens for a reason and then I just find more love in my heart to give. I have shared photos of one of the several crystal friends I have that has gone through this. These are images of a very beloved and special Lemurian I have that slightly slid out of my hands and hit the corner of my nightstand, then fell to the carpeted ground. When I picked her up to check her out, I found this newly created rainbow reflective portal. She previously had none, just like the other corners you see. The area did not break off, or chip, but the impact created a rainbow fracture or platelet (that to me feels to be like a new growth she birthed) that now acts as this doorway to a whole other level of experience and energy. It could very well have completely broken off, but instead she created a new layer to her vibration. I have others that have chipped and broken off and know others who have completely shattered into pieces. They are living beings just like us and go through shifts same as we do. Life is about the experience. Posted on June 26, 2012, in Uncategorized and tagged cracks in crystals, crystal cracking, crystal energy, crystal healing. Bookmark the permalink. 187 Comments. thank you for sharing your feelings. i hope to provide more insightful and inspirational words as i am guided. This was a very nice read Tania and I thank you for sharing your insights with us 🙂 You made me think of my favourite Rose Quartz dowser. It has been with me since 2010 and it does indeed feel like we both grow together day after day and our energies keep syncing and matching. Loveliest feeling ever. your welcome vi, glad it drew you to reflect on your beautiful rose quartz. our crystals are amazing, aren’t they?! so many miracles around us. you are one of them! It’s interesting because the Lemurians in my life seem particularly prone to this. My two handheld Lemurians that I used to use every day for meditation suddenly had developed many nicks and dents that I know weren’t there before. Oddly enough, I had not held them in several months, so I don’t know when it happened, but curious synchronicities led me to recognize the Divine Perfection in all of this. On the day I found the nicks, I had “randomly” picked up the crystals right before a phone call that I intuitively knew would come through. It was a friend I hadn’t spoken with in over year — a friend who had never shown any interest in crystals. The second sentence out of her mouth was all about Lemurian Seed Crystals and how her new neighbor was “really into crystals, especially the Lemurians.” We ended up talking about crystals for most of the conversation. Then, more recently, David had bought me one of the LOVE little Lemurian pendants. We were out and he wanted to take my photo on a bridge. I leaned into the bridge and kind of smashed the pendant against it, but the Lemurian seemed fine. It still looks fine, but if you feel it, you can tell there’s a chip out of the sphere. I think it looks even more powerful now, though, as this chip makes it glow with light and rainbows. It didn’t look so alive before it’s “accident.” Anyway, great article. Those crystals are up to some major regridding these days! yes, that IS interesting that it is happening a lot with lemurians. the pendant that my client was asking about and had dropped, was also a lemurian l.o.v.e. seed crystal pendant just like yours 🙂 the lemurians are super active right now. i’ve been working with the lemurian i shared in this blog, a giant 8″ diameter lemurian sphere (like the grand momma to all the little l.o.v.e. seeds), and one of my giant lemurians that channels archangel chamuel, to do healing sessions recently, along with my quartz/fossil healing tool – (remember that one i showed you? 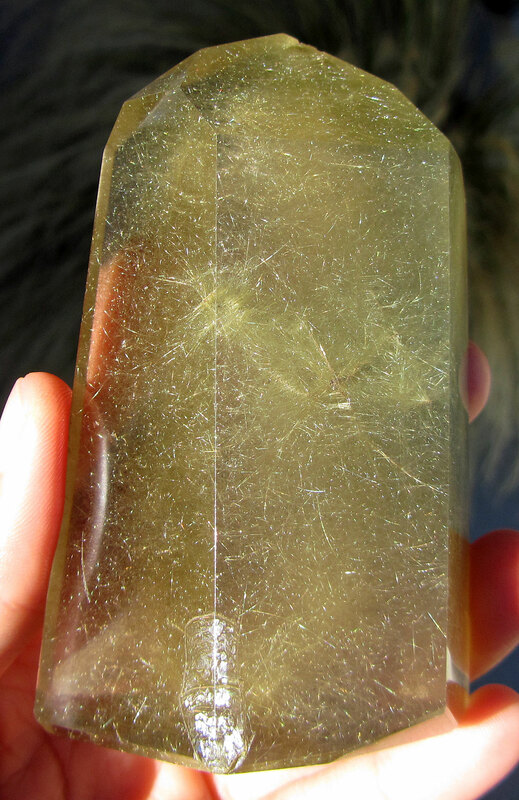 ), but i feel the quartz on top is both lemurian and atlantean. very cool synchronicities with your lemurian and the client. i love to hear stories like that. and yay on your pendant! i’m glad it is safe and even more alive and potent!!! similar to the one i showed in the post – creating beautiful displays of light and rainbows! yeah, really…they are up to some major work right now! xoox love and big hugs! My twinflame lemurian crystal broke after I had dropped it… Is this an omen? I was thinking of gifted my twin with the broken piece when the time is right. We are in separation right now. Yes, and AA Chamuel seems to be very active lately, too. He keeps coming up in sessions as being there for clients to turn to in their own seeking for answers and healing. xoxo love and hugs! Great to discover your blog with so much great content. I recently accidentally dropped a small to medium rose quartz I usually carry with me. It now has a crack across the middle. I was wondering should I discard or keep it since I’m not sure how this may affect my energy. Is there a healing crystal method for these situations? Thanks in advance for any insight you can provide. Thanks! i really appreciate that maria and glad you have found my blog and this particular post to be of value. i hope you have come to the conclusion to keep your beautiful rose quartz crystal, as its energy is just as perfect in its imperfection, as are you and as are we all. there may be methods people would use out there. for me, i would just provide my crystal the love and appreciation that i myself would also want to hear and feel. sharing your gratitude and continued honor for its gifts and seeing it in its wholeness as it is. if you did any kind of energy work or reiki, you could also infuse it with energetic love and charge it. maybe you can put it in the sunlight or moonlight. forgive yourself for any feelings you may have of guilt or feeling bad for what happened and realize the beauty of the journey together. I am so happy to visit your site.. I have been carrying 2″ sized quartz crystal with a Dragon etched in it on my person daily for more than a year now, this morning the stone fell out of my clothing onto the tiled floor and broke, for the most part into (4) pieces off of the back of the Crystal only… hmmm: (2) small pieces, (1) medium sized piece and the front 2″ inches of oval shaped crystal, which is intact. 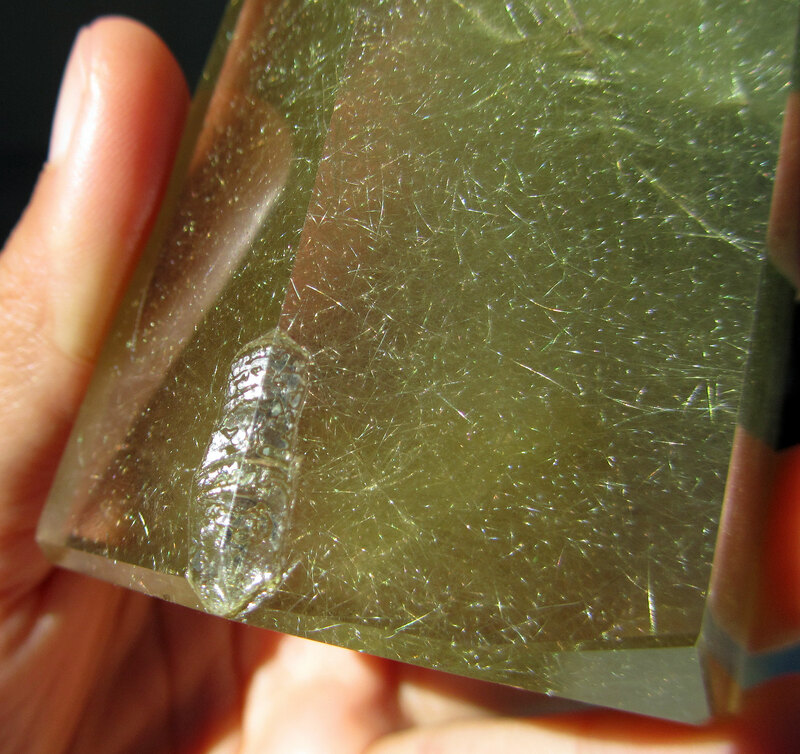 The dragon etching is what broke away from this quartz crystal…. and the larger piece (front) is vibrating like crazy. I know of a coworker that is going through some difficulties so I just gave her the medium fragment, which has quite a bit of the dragon etching on it today. Thank you for your thoughts and as I reflect, I originally chose the Dragon etcjed stone for the symbolic protection, maybe the negative “vibes” that at the time surrounded me have disapated or I am much stronger and they no longer effect me. very powerful insight..you’re welcome. i’m glad you are receiving more connection to the personal meaning for you. Thought you would find this interesting.. Do my Dragon etched 2″ Quartz crystal fell and broke yesterday, I put on a Smokey Quartz Dragon etched pendant last night and it fell off of the bale into my lap this morning. Hmmmm – thoughts ? interesting…what do you feel about this leah? i think your energy is shifting. this can happen when we are going through change and expanding…crystals will reflect the energy. Why do my crystals that I wear everyday are starting to get red specks on them? ? i don’t know what the red specks are in terms of their chemical make-up, but to me it is just another form of how crystals are living beings that are constantly shifting and growing, just like us. perhaps note when the specks started appearing and any mirrors to things in your life that have been going on at the time to see a connection. Thanks for your article! I am very new to using crystals and tonight I purchased a beautiful quartz crystal with lots of internal rainbow and fluorite sparkles in it. I brought it home, and before I even had a chance to cleanse or energize it, a small chip came off the side. I was devastated reading articles that this meant the crystal isn’t for me. After reading your article I feel better about maybe the chip happening for a reason (whether to let energy in, or out). My plan now is to properly cleanse it with sage and energize it in the sun. My hope is that this will heal the crystal and it will be ok to use. Any recommendations on what to do with the tiny chipped off piece? My intuition is telling me to somehow put it near my husband. Haha is that weird? What happens when cystals get red are brown specks of color on them ?? Are turn three different colors ? again, i’d like to share that it’s good to check in with your own intuition and see what the changes might mean for you. you can also meditate with your crystal and ask questions, listening for the answer that comes to you. or you can observe what is going on in your life and if the changes mirror anything for you. the crystals also have their own unique journey and transformations so their changes are part of their experience. how might the colors represent changing colors within your own life and personality? are you revealing your true colors? that’s awesome! and i agree, any shifts make them more beautifully unique and special. Hello Tania Marie, is it okay to charge your crystals on full moon even if it Friday the 13th ?? that’s awesome traci! they definitely mirror us and our journey. such amazing beings they are. Hi there.. I purchased a rainbow fluorite crystal that’s mainly green with some purple and I was holding it in my hand and it literally broke in half! Is this some kind of sign?? Is it that it should not be with me, or that the connection between us is so strong that it split? truthfully only can be the judge of that. i always encourage people to check in with their own intuition, meditate with the crystal for answers and be very observant and conscious about what is going on in your life that may be mirrored by the experience. perhaps you are in a time period of major change and the crystal is mirroring this growth and/or need for a shift to happen. Wonderful article. I too feel it is most often about accepting imperfections, and change. However I have an interesting situation, I own a lightly colored beautiful Amethyst carved into the shape of a wolf head, (my power animal) it has a hole drilled through the sides and I put it on a necklace of white bamboo cord (purity/luck) with Rainbow Moonstone beads. I often sleep with a chosen crystal or a few at my bedside, with the Amethyst all my dreams are remembered and vivid, I had 2 dreams maybe 3 days apart where my wolf head broke into pieces. And I was very saddened by it, and upset. And since, I have been EXTRA careful with it taking all precautions. I’d say no more than a week went by and as my fiance was trying to close our kitchen window my potted spider plant sat which had 2 Clear Quartz Crystals and an Apache Tear in the pot, the plant got knocked to the floor as the window caught the rim of the pot coming down, but all 3 stones were sitting lined up on the window ledge somehow. Upon closer inspection only one of the stones (a Twin Crystal which was my favorite out of both Quartz points) had chipped a tiny piece near the point of the larger crystal and a good chunk off the base, the chips couldn’t be located so are probably under my fridge or something. I was SO upset at first, and was already having a bad two days, but then I accepted that the crystal still felt the same and was still beautiful and everything is ok.
Or is it a preview to prepare me for my Amethyst breaking? Thank you. It it is very possible I had the dreams out of worry haha. Thanks for reading and taking multiple insights. I had been given a small tumbled quartz in New Orleans to carry with me about two weeks ago. It was quite clear just a little cloudy, but yesterday I noticed it has a pinkish hue now. Can Quartz change color like that? If so, what does it mean? Thank you! yes quartz, or any crystal for that matter, can change color, shape, grow new parts or inclusions, etc. perhaps take a look at things in your life currently going on and how the change may be reflecting something for you either in what is going on or a change happening/needing to happen, etc. pink is the color of compassion and love…how might you nurture more of this in your life for yourself? your crystal may be assisting these energies in your life or perhaps your crystal friend is helping you with relationships…there are many ways to interpret…it’s always best to use your own inner guidance and trust it. I have a rough crystal that is foggy inside like girasol (not entirely sure what type of crystal it is) that did this too, when I noticed it I immediately washed it thinking it might be oil from my hands that tinted it but I think the crystal legitimately changed color cuz its the whole crystal and obviously doesn’t wash off lol. It also showed a rainbow when held in bright light for the first time, and then a week later the rainbow inside disappeared. But the light pink tint remains. I have an idea what the rainbow was about as I was going through some self worth issues at the time I found it, and I think once the crystal healed me it healed itself too. It wasn’t necessary for me to see the rainbow anymore. But I still don’t really know what the pink is all about. Self love/acceptance maybe? In my situation atleast. My gorgeous smokey Quartz merkaba fell a few inches out of my hand onto the edge of the petrified wood slab I keep it on and one of the points chipped. I didn’t know if I was supposed to glue it (if the merkaba shape had to be exact with all points intact) or if it was ruined… But after reading this article I asked it what it wanted me to do. I asked if I should give the broken piece away (no), should I return the broken piece to the Earth (no), keep it nearby in the holder with the other small crystals (yes). i love this story of yours jacqueline…thank you so much for sharing it. this is exactly what i was expressing and you so beautifully demonstrated it. i hope that others will be inspired by your experience and find their own way with their crystals when things happen, as truly only you and they know the answers. together you can explore them, as you did. what a sweet expression yours had to share with you. ❤ ❤ much love! So happy I found this blog! I love your energy & the way you talk about our crystal friends. I’m pretty new to crystals to be honest. I purchased a small rose quartz to carry on my person & she fell at the gym, broke into 3 pieces. I threw her out not knowing how to properly dispose of it. Ironically I purchased another bigger ride Quartz to carry on my person just the day before! So I was glad. I do cleanse my crystals before wearing them or placing them in my special place with a sage smudge ritual. Hi there I just came across your blog as I recently broke two of my crystals within two days and I’m so sad. I take such good care of them all and I don’t know what to do. My fluorite crystal broke completely into two peices and my lemurian seed crystal broke into three peices. What do I do with the peices? Please help! Wow thank you so much for this insight! I just now “accidentally” dropped my crystal heart pendent and it too adapted a beautiful rainbow this was the first thing I noticed. I also noticed a little tiny crack. My question is when these crystal develop fractures is the energy of them still the same? so glad you found this article helpful erin. how wonderful that you have a rainbow moonstone ring…i have one too. it is such a wonderful stone. here is info i shared on it from another article on my blog: This acts as a prism that diffuses energy throughout the aura. It assists in clearing the psychic senses and the mind and brings the frequency of joy to the energy field. It is a positive protection stone, helping to deflect negativity before entering the energy field. It is particularly good for psychic protection and for maintaining clarity of energy while working on an intuitive level. Rainbow Moonstone can be helpful in clearing the emotional body, as well as can be useful to ease emotional trauma and create balance in your life. It is a stone of new beginnings, balancing the psychic centers and grounding negative energies. It helps one to recognize that new beginnings are in fact the fruition of each ending. It allows one to accept gracefully the ups and downs and supports a calmness during the process. Connected to the water element and lunar cycles, it is specifically helpful at opening one up to their spiritual gifts, getting in touch with intuition, empathy, and feminine energy. Rainbow moonstone is a wonderful stone when used in Reiki healing sessions, by placing it at the crown chakra it helps to open the crown up. i believe that we are drawn to things for a reason and there is always a purpose and message in the types of crystals we are drawn to. inclusions are not bad things…it adds an extra element of energy, as the inclusions will carry another vibration that adds to your crystal’s vibration. a good beginner reference crystal book is The Crystal Bible by Judy Hall. I hope you enjoy your new crystal friend and come to appreciate all the wonderful qualities she is reflecting for you to embrace about yourself. in crystal magick and love! I would also like to recommend the Crystal Bible !! It is a great reference for the properties of each stone. I use mine almost on a daily basis !! I have been told by various people that I am very intuitive and a healer. I have also been told that I just need to accept this gift and decide what I want to do with them. I tend to feel things more so than hear or see things. I also have the possibility of a new venture in my work. Don’t know if there is a link there or not. I am thinking that maybe the wings are angel wings from my twin sister that passed away at birth, and that the veils are the joining of her to me. Your thoughts?? Thank you so much for your insight to this. I really do appreciate it. I may be interested in your classes. I will look into that !! Thank you, Love and Peace for you. Hello and thank you so much for what you shared with the world. It made me feel so relieved when I found it as I just had an accident with one of mine. I was carrying a piece of angelite on me today and it slipped from under my clothes, fell on a very hard floor and had a few dents and cracks. My first reaction was to cry and feel like it is my fault and I don’t deserve having it. But when I calmed down and started looking at it from the curious point of view I realised the little cracks on it were in the form of a pentacle star and this got me really wondering about hidden meanings and messages maybe. Have you ever seen or heard of anything like this? you’re so welcome vivi! i’m glad it helped you with your experience. how amazingly beautiful your angelite sounds with her new pentacle star! that’s magickal! i have heard and seen of crystals carrying many symbols within them…some starting out that way, and some growing/creating them later. it is a very special thing to have happen, as you have. quite a gift! perhaps you can do some research on the pentacle and look how it is messaging you and where your path is leading. love and crystal magick to you! you’re welcome. i’m sorry that happened and yet it’s part of your evolution in finding once again the opportunity to see things from a different perspective and find strength in trusting your own guidance, regardless of what others believe. that is something no one can take away from you, except you. My 5 year old grandson dropped my crystal and caused a sharp edge. He later was playing and fell on the sharpe edge and got a deep cut in the palm of his hand that might need stitches. I feel so bad that I didn’t put the crystal away before he got hurt. I am trying to look for anything positive that could come from this. I just feel so guilty. Thank you for your help. It helped me so mush. You helped me see the positive. I’m new to working with different stones. I recently lost my crystal Quartz and (I loved it) purchased a rose quartz and I’ve dropped it twice already. It has now shattered into three pieces (due to me dropping it) and I’m scared to touch it. I don’t know if I should give it up and buy a new one. I also don’t know if me dropping it was a mistake. It seemed to fall and break after thinking of a particular person….. Thank you for the info and hoping this new year provides you with many, many blessings. you’re very welcome bonniboo. i would suggest meditating on it and asking our crystal if it has any message for you. also look at what’s going on in your life to see if there is any reflection of perhaps change happening or needed, and/or what the crystal might be sharing. Last night I had a dream that my macrame necklace that holds my Rose Quartz pyramid broke, once thru the actual pouch that holds the actual stone and another 3 or 4 places along the part that loops around my neck. The Rose Quartz wasn’t damaged at all. Can u help me decipher this? The Rose Quartz actually has the tiniest chip on the very tip as well, it’s barely noticeable, but that happened ages ago. Not at the time of this dream. I would love to know how this is all connected and what relevance it has to me if you can help please? hi jo…i always like to direct people to focus on what might be going on in their lives currently, as our dreams message us in symbolic and literal ways, just as much as something that happens with our crystal friends directly reflects a message to us as well. there are so many things it could mean and so you need to trust your gut/intuition on what feels right. could it foreshadow that your necklace may actually break and so your crystal would be safer at this time elsewhere? could it be that some big change is about to occur in your life, with your relationships, in the work that you do that is in service of others, a new passion coming forth on the scene to follow…take a look at relevant things that may coincide with the energy of rose quartz or anything wanting to shift in a big way. This reminds me of an incident that happened in one of Kim Russo’s “The Haunting Of…: shows during which she had entered Fairuza Balk’s work apartment to investigate spirit activity and the black tourmaline chunk she was carrying for protection slipped from her hand and shattered on the floor. Rather than regard this as a misfortune she recognized that her guardians had actually magnified the power of the stone by scattering it in smaller pieces across the floor, and she let it lay as it was for the duration of her visit. oh i love that example you shared..another perfect reflection of how changing our perception can make the difference. thank you bo! I recently had a stone that shattered. I have quite a few stones that I store in little bags for when I need to use them. This one stone in particular was in a bag in my dresser drawer and was fine when I put it in there. The other day, I went to get all my stones and when I took this stone out, it was shattered. Was fine when I put it in there, and shattered into about 7 pieces when I took it out. It is amazing what these stones can do, all on their own. it truly is amazing! thank you for sharing this karla! another great story and example of the miraculous nature of crystals to shift and transform just as we do. I also have a smoky quartz that I am trying to figure out what is going on with it. When I purchased it, it was very, very clear. Purchased it because of that. Now it has two brownish orange (wings) in it. another is forming right next to the other, making a total of 3. There is also some cloudy lines going from one wing to the other. These clouds are whitish in nature. Just trying to figure out what is going on with this stone. Is it shielding me from something, or is it more about what is going on with the stone?? Any input would be appreciated. This stone also has a rainbow in a different spot and several little black flecks in it as well. It really is a cool stone. I have been told by several that I have some intuitive and healing abilities, I just need to accept them. I am also thinking of doing something a little different on the job front. Self-employment?? Possibly?? I also had a thought just pop into my head that one of the wings could be my twin sister that passed away at birth, and the other wing might be me with the veils between us. Any thoughts?? Thank you very much for this informative article. It really helped me. I bought a manifestation quartz yesterday and it is a stunning piece. It is crystal clear and has quite a few natural geological fractures that reflect rainbows. A rainbow fracture at the bottom looks like a butterfly sitting on a flower in a grass field from one angle and looks like a goldfish swimming at the bottom of a pond amongst waterweeds from another angle. The rainbow fractures near the top look like strange but beautiful wave patterns and amongst them, a small crystal(the manifestation) floats. I am quite a collector and I love collecting unique looking stones and minerals. When I saw it in a crystal shop yesterday, I was impressed by its perfect look; crystal clear clarity, perfectly smooth surfaces and perfectly sharp edges. I bought it even though it was quite expensive. Anyway, I had to hop on a train on my way home and, when I was close to the train station, the train I needed to catch arrived and I had to run in order to catch it. And that was when I heard my manifestation quartz clashed with my stainless steel vacuum-insulated thermo flask in my bag. I was greatly troubled. I really couldn’t understand how that could happen when the stone was properly wrapped to protect it from impact. I couldn’t unwrap the stone to check it in the train on my way home because the train was packed full people and I had no place to sit. When I arrived home, unwrapping and checking the stone was the first thing I did. It looked perfectly fine, except one of its edges is chipped. I was devastated, and I felt guilty as well. I couldn’t help kept thinking how I could have avoided this if only I was patient and didn’t rush just to catch a train to get home. I held the quartz and stared at it in regret for the most part last night. But I noticed something different. The manifestation quartz started emanating a loving energy, something I have not felt when I first saw it in the crystal shop and something I have never experienced in my life. I was still bothered by this when I woke up in the morning, and I decided to search online to see if quartz crystals can heal their injuries on their own and if not, if there is anything we can do to heal them. And the first thing I saw on Google page was this article of yours! And I learned that such thing happened for a reason. I looked at the chipped edge again and I noticed the four tiny indentations are aligned in perfect symmetry; the two inner indentations are close to each other and the outer two are quite far apart, and their distances are perfectly symmetrical. I don’t know what this means, but I now know it didn’t happen by chance or accident, something I hadn’t noticed in my devastation last night. I held it in my hands again and once again, I felt an unconditional love emanating from it. Now I know what it is trying to tell me; I deserve to be loved. I deserve love(kindness and compassion) like everyone else, and it is willing to love me. I had self-worth issues and I had come to accept that I am not worthy of love because I constantly experienced prejudices and racial discrimination from other people a lot. But this manifestation quartz, this little thing has changed me in an instant. I cried when it made me realise this, and I kissed it and I really love it. This is the first time in my life that I have an unusual and life changing experience with a mineral. Now I appreciate myself and I do believe I deserve love, even if most people out there are nasty towards me. It’s truly amazing how a small thing can make such a big difference to us. And of course, if you hadn’t shared your beautiful wisdom with us through this article, I wouldn’t have come to this realisation. Now I do believe that rocks and minerals are living things with souls and personalities like us. And my beloved manifestation quartz is a small thing with a big heart who can love unconditionally. Once again, you have my deepest gratitude for writing and sharing this article. And I wish you the best in all areas of your life. Hi! I’ve always wanted a large rock Quartz (Palm sized) for meditation and increased clarity. Today I purchased one in a gift shop- not any place particularly spiritual…. Thank you so much!! Any idea’s on setting intention? Just one little caution – if the quartz has any cracks in it salt from salt water can work its way into those fissures and then eventually cause stress within because the dried salt will expand and contract with changes in ambient humidity. Over time that can be like driving a wedge into those cracks and causing the crack to spread or even cleave the crystal. It’s sort of like the effect of expanding ice being able to crack rocks. I have a small flat pale tumble amethyst. I keep it in my bra during the day. Yesterday morning I had a scary incident with a horse spooking and bolting flat out. Both of us ok.
I’ve been doing this like that for s week or so. Last night, after crashing asleep on the sofa I got up to go to the bathroom, and then to bed half asleep and the crystal came tumbling out and hit the tiled floor and broke!!! A slither the size of a thumbnail has come off. What do I take from this. Cani still use the larger bit of crystal and what do I do with this tiny piece? hi vaisha, thank you for sharing. from the article i wrote you should be able to take away that there’s nothing wrong with your crystal and yes you can still work with it. i shared my own experience of this in it. only you can pinpoint the message and sign, as you are the only one who knows what is going on in your life at this time. i suggest meditating on it and asking for answers. ask your crystal if it has a message…and trust what you receive. there may be something in your life it is drawing your attention to. The energy will be slightly different, but that is a good thing since you have probably already absorbed the original vibe. The new vibe will be a different adventure and a different lesson. I am reminded of my earlier post in this thread about the medium Kim Russo explaining the dynamics of a dropped and shattered piece of black tourmaline which occurred during her exploration of Fairuza Balk’s haunted apartment. see above. Wow! I feel better after reading your article. Thank you for sharing. I had a rise quartz in a shape of a heart bought to me by my mum. Quite large ir day in size. I kept it inHimalayan rock salt water for few hours to cleanse. After couple of weeks or so I say down and held it in my hand for almost an hour and afterwards I freaked out I noticed I was covered in red patches throughout my body my scars became intense red and some places were slightly burning . Ir like to know if there’s a possibility for this stone to be clashing with my energy or the opposite? I was meditating tonight on the base chakra and was holding a pyrite crystal gently in my hand. The shape was more or less oval. When I opened my eyes after the meditation it had changed to a very distinct heart shape. Blew my mind…can you explain this please.. Thank you for sharing this information. I do accept that things happen for a reason. Let me share what happened with my polished malachite. I wear it close to my body and when taking off my clothes it fell on a ceramic tile floor. It ended up with several chips and a fair size one on one side of it. What concerns me is that malachite is copper ore and toxic to humans. Is my stone still safe to use? As long as it is polished it is safe. As well it has become quite dull even though I cleanse it often. Any thoughts will be appreciated on this. you’re welcome leslie. thank you for sharing your experience. i’m not an expert in terms of being able to advise with that, but always feel that your intuition is the best source to turn to for meaning and answers. i understand that in large quantities of exposure to cut malachite, breathing in dust, ingesting etc. definitely would be of concern. if you’re not doing any of that or rubbing it into your skin or open wounds, then it likely wouldn’t be threatening. that said, everyone is different in sensitivities and you could very well have reactions or adverse effects that maybe someone else might not even in doing that. if concerned perhaps you can just have your malachite as a stone of support that sits on your altar or special area. just be sure it is away from animals or children who might get a hold of it. or maybe have it set into a setting that covers the chipped area. or, you could ask the stone about polishing it and have that done professionally. I was put my crystal away for the night . One of them drop down the AC unit. I try to receive but I can’t get it. The reason iam use them is because am going out with a guy . Our relationship is complicated the funny thing is he’s a maintenance person who works on air conditioners and Heating units and he’s electrician you know that type of deal so I don’t know if this is sign please tell me if this is a sign or something. hi laura, i’m sorry to hear of your experiences and what seems to be causing you some level of stress. unfortunately, i am not a psychic and feel that we each have our own intuition that if trusted, will provide the answers. the fact that you connect these things seems to indicate something for you to look at with this. my guess is that you know the answer, but perhaps are afraid to look at it or follow the feelings you have, which is very common for everyone. in any case, your crystal seems to be getting your attention. i suggest you meditate or get quiet and ask your higher self some questions and trust the answer. sending you love and peace during this time. Recently, I bought a yellow saffire ring. I realised that when the gemstone vendor had shown me the stone it was transparent and in there were no broken side. It’s oval circular in shape. But after he got it the ring done with the stone, I can see a cut break in one side but I still wore it and did not go back to that shop to ask about it. Should i continue wearing it? Will it have a effect in my life positively still? Please advise. Linked with Gratitude to this from https://astrobuss.wordpress.com/2017/01/08/reanimating-2/ . What about when a stone ” takes a hit for you? My carnelian it spekled with black now and i was told it took a few hits for me. Im looking for a further explanation on this. I know this is an old thread but i have had a selenite crystal wand break in half and even a solid glass christmas tree ornament of 4 inch by 3 inch “collapse” in to chunks while resting on the mantle of my fireplace. The fireplace in inoperable so it could not have been the heat. Is there perhaps some energy or vortex associated with this spot and how do I correct it? We do not live in an old home I an wondering if it is an energy line. I clear energy regularly with my crystals and with sage etc. I just was shocked by this finding in relation to one spot in my home. The glass ornament was solid glass and the chunks it broke into were the size of a nickel. It would take some force to do this. It was like it was obliterated. Thank you Tania. I had made a new year’s resolution which isn’t something I usually do or believe in and it has been difficult. (no its not dieting ha ha) It sounds cliche but I am trying as many folks say to release what “no longer serves me.” I have found the hardest part of doing this is other’s reactions to what I am trying to achieve. Like they do not want me to move in my new direction because it takes me away from the “state” they currently are in. I am moving toward peace and they enjoy the chaos and drama and the negativity that brings. I have stopped trying to “take them with me” so to speak. So along with releasing what no longer serves me I vowed to also stop talking about my new found “understanding” with my old friends and family as that was not going well for me. I am so excited to share my experiences as much has opened that I never even knew existed but it is not being received well as they are not in a place to receive or understand which is OK. (that is the way I used to be)It is challenging to their belief system. So yes your intuitive part of interpreting my situation was spot on as I am holding back. I want to share but find it difficult. I will meditate on this and as you say this could be reflecting a paradign shift for me . My selenite sitting untouched on the mantle made its way into two pieces and is speaking loud and clear! Now it is my job to intuitively interpret this event and your response has helped a great deal. There is also an energy in the house that I am going to try and clear with dowsing. I am new to your site and was happy to find it as a result of my google search and so I subscribed. I thank you for your reply and for your sage advice! this all makes perfect sense mary….i knew you had the answers and very clearly in fact from your response. you’re most welcome and thank you for sharing so vulnerably. i encourage you to continue this flow of expression. thank you also for sharing this so that others may understand their own processes and connect with your story. when we are willing to be transparent, it assists others to do the same. grateful you’ve connected here and for joining along in the journey we are cocreating. much love to you and peace in your heart as you continue with these powerful life transformations.thank you for your courage in doing so as it trickles out to others whether you know it or not. I absolutely love this!! I have most of my spheres on a small table in my chill/mediation room and yesterday my one smokey Quartz kept rolling off from my friend hitting the table twice. I didn’t want to make a big deal out of it but I noticed it suffered a little. I felt awful. Reading this made me feel better. I also got a new citrine today and it rolled out of my hand onto that table!! Maybe it was to create a small inclusion that is meant to be a new energy for me. I also got a ring with a watermelon tourmaline and hit it super hard the first couple of days! The new inclusion bothers me but again reading this article makes me feel better. Not sure if the pattern means anything. This has all happened within a week! Kinda crazy. Thank you! Winter (2017) the same gentleman and I got together to catch up and exchanged stones and obviously I felt the citrine was the most appropriate. He has left it out to charge for a week now and has just explained to me that when he went to pick it up he experienced another shock! I have a feeling that this has some symbolize and would be curious to hear your thoughts!! Thank you for your post about “accidental” breaks and cracks!! I have been wearing an Amethyst bracelet, and also an Unakite, for the past year or so. Just a couple days ago, I was having dinner at a restaurant and I felt something tight around my leg. I took a look, and noticed my Amethyst bracelet somehow ended up from my wrist to my ankle (maybe while I was changing?). Anyhow, the day after, I went swimming. As I was changing, I accidently pulled on my Amethyst bracelet and the wire broke. The beads scattered all over the floor. I picked them all up, but I was just wondering what this may mean. The crystal didn’t break but the wire that was holding it together broke. I charge my crystals by keeping them in the sun and Im afraid some of the color crystals faded, especially my amethyst and rose, I felt like getting new ones, Im sorta ocd about my magick things, Ive replaced certain tarot cards several times, ect. Ive carried my crystals together in bags before, my quartz edges on most of my prism seems like perhaps got chipped that way idk, I get really upset about that stuff and always want things back the way they were and maybe its just that I have to learn to be more accepting of those things but its hard for me to use them when I feel so guilty and upset about the ways I may have damaged them.. I feel like they’re not good anymore. Idk how to overcome this perfectionism I feel in some of my spiritual work its a real problem for me. Do you have any advice, it seems like its hard for me, its hard for me to get over it. I love this article! I thought I had lost my mind when I felt compelled to “rescue” two beautiful crystal clusters from a department store in the home decor section. One is the deepest purple amethyst I have ever seen, and the other white and clear quartz crystals. The regular quartz feels like it is deciding what it wants to do, but is happy to have a home. The amethyst feels like a long lost best friend! I have honestly never been so drawn to two crystals before. This article let me know that they do indeed have personalities and that I’m not imagining it! Thank you so much! I brought a rose quartz crystal on a key ring about two days ago. I put it on my car keys so it is with me at all times. However today when I was putting my keys on my pocked the crystal jumped out my pocket set arching itself from the chair part. Some of the chain was still left on so I picked it up and put it in my pocket but wonders what this may mean? I am not sure as I was at work and had just got out of my car to meet another colleague. It was like it was trying to escape from me. Had I not been with my friend I might have not known it had come off however it did bounce away from me and made quite a loud bang as it hit the floor. Maybe I need to love myself more before, I carry it around with me. Hi Tania Marie, great article! I read your introduction about not intending the post as a way for indiviudal readings etc. However, I wonder if you or any of your readers might be able to share some suggestions or insight. I have a slightly bizarre situation. I was working with my citrine tumblestone this morning (charging some water by the light of the sun). About an hour later I was in the bathroom and the citrine flew into the bottom of the toilet bowl! Hahaha It’s still there, I can see it. But I’m not sure, does this mean that the crystal is ready to move on? Should I fish it out and bury it in the garden or just leave it where it is? I never imagined I’d have this predicament! Sharing your life with crystals can be so strangely wonderful! thank you suzanne and thanks for sharing your life and love with our crystal family! as always, i encourage people to check in with themselves and even to ask the crystal for anything it has to share. trust your intuition. my guess is there is something very clear that you were working on or that is going on in your life that will provide the answers when we are willing to embrace them. anyone’s advice will only be suggestions or their own interpretations. you hold the key. trust that. awesome!! i so love hearing that you pieced it together. such an empowering experience! thank you for sharing this for others too! Thank you, this blog helps so much. I’m new to crystal energy and I just bought a green beryl crystal to help with some issues I’m dealing with, in less than 12hrs after buying it and just after an important phone call I accidentally dropped it and it broke in two. I was upset but then I started reading advice about broken crystals online. I read about meditating on why the crystal broke and listening to its story and the top half clearly said to me that a lot of negative energy was trapped in the bottom half and it needed to be lighter and free. I’m not sure yet to keep the top half but I think I should put the bottom half back in the earth rather than passing it on. Broken crystals provide a fine opportunity to use the energy in a different and often more powerful manner. By holding the fragments in both hands simultaneously a circuit is made across the body that is sometimes more energizing than using one crystal alone, and since the fragments came from the same crystal the circuit is usually more coherent and stronger. Thanks, I haven’t done anything with them yet, I have both pieces with me, just still letting them talk to me. Hi. I’ve a 5cm lemurian star seed crystal. Its my favorite beautiful crystal, very rough with an interesting little universe inside. I carry it in my bra. Use it to meditate and heal myself and others. I put it in a stone bag with some other crystals one day when I was very down and had them all in my lap while I was driving to the coast one day. When I got home I took out the crystals there was some chips off some amethyst and a chip off my beautiful lemurian friend. I was fine with that but I was also amazed that it had turned from clear to a slight golden colour. Does that mean its now a lemurian star seed golden master healer? Well I know it is myself I gets very warm to hot very quickly. Have you heard of this before? Tania I have placed my new crystals in a glass pot and a few hours later i found the pot broken in peaces and the crystals lying outside except two remaining inside the broken pot; what do you think? I had a bracelet made with clear quartz crystals and i noticed that the crystals went green sometimes and other times blue and pink. I thought it was soo pretty and maybe it meant something! if you know for sure your crystal has never exhibited this color (when viewing indoors and in sunlight – as this can shift and make many things apparent that weren’t) then it may be that an energy shift has taken place due to an exchange between the crystal and its new keeper, as well as the transformations and shifts you are all sharing. thank you for sharing your experience mary! I’ve been wandering if the fractions inside my quartz crystal do affect the energy they have. I also remembered that a great researcher of crystals Les Brown said the same thing, that crystals are our friends and we should treat them that way. thank you so much for the informational link. i’m sure readers will find it interesting and relevant! i also appreciate your comment. i’m glad this was supportive for you ❤ you're so welcome. much love! Excellent post! The other night, I was feeling scared. I had felt something touch my hair and as I opened my eyes, I looked over to my piece of selenite and it was glowing green. What could be an explanation for this, in your opinion? thank you for your words J! i don’t know your personal experience with this and i always encourage people to trust what they feel, any messages that come to them, and/or to meditate on the situation at hand…even to ask your crystal about it. this is the best answer you’ll receive is the one that you find within your heart. sometimes we feel fear and it’s not actually something bad or to fear, but can be something we’re just not used to and/or activates a part of our essence to remember something. perhaps your selenite was reflecting something for you…was activating healing energy and your heart chakra to open up even more. maybe there was a presence around you like a guide there to help. there are far too many reasons things might be. what do you think, given things in your life and what you felt? Beautiful! I just found that my rose quartz has an orange streak in it, which was not there previously. I got a bit worried that I was doing something wrong. 🙂 I kept it in a box with an unburned palo santo, and for some reason this rose quartz has become very dear to me. This was very helpful ♥️ I bought 2 crystals a couple of years ago. They were flat and round about the size of a half dollar. I always carry them with me. I also sleep with them. One is tiger iron and the other is snowflake obsidian. A couple of weeks ago, I woke up to find that they had changed shape. One had a point and the other had a flat side. thank you so much for sharing this doris ❤ it's always fascinating to hear people's experiences with their crystals. so much is transforming these days and i'm not surprised by the stories of crystals transforming and even bursting into new embodiment. This is so beautiful! Thank you for sharing! This has set my mind at ease about a chip that I noticed recently in a beloved chlorite quartz point. Pingback: Cracks, Chips and Crystals – Oh, border!